I’ve had an exciting week! It started on Sunday night when I bound off two projects. One of them is my Marled Lines for the RevampKAL2 in the La Maison Rililie group on Ravelry. It’s very comfortable in cotton, silk, and wool, and it kind of makes me wonder why I don’t have more tunic length, short-sleeved sweaters. I need to work on filling that gap in my wardrobe. On Monday I started my first test in the Free Pattern Testers group on Ravelry. I have five volunteers (so far) who are trying out the pattern and looking for mistakes. There shouldn’t be many, as it’s already been tech edited, but it can’t hurt. I’m excited to hear what the knitters think of my pattern, and to see it knit in different yarns and sizes! I’ve set the deadline for May 15, so if everything goes well, Miss Suzanne should be released soon after the test is finished. I also finished writing a pattern this week. You may recognize the fabric from my last post; it’s Drops Fabel sock yarn in a marled blue that reminds me of jean jackets from the ’80s. The design itself is a bit less dated. The shoulders feature a compound raglan construction that I ripped and re-knit at least four times, and the utilitarian look of the sock yarn is softened with a pretty little lace cable. I still have to knit the sleeves, but they ought to go fast now that I have all the details worked out. 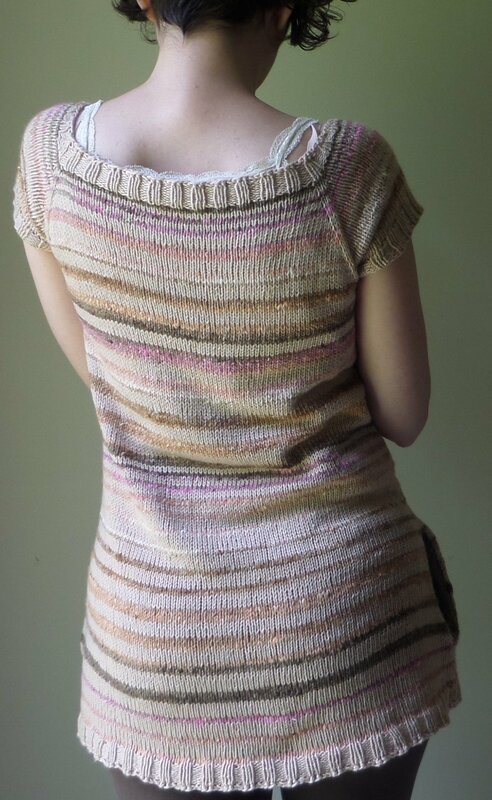 Then I’ll need to take photos and have the pattern tech edited and test knit, but it should be ready this summer. The last, and least exciting event this week was the arrival of my very first rejection email. Over the last month I have submitted design proposals to three different publications. I’m still waiting to hear from the first two, but this one is a no-go, and that’s okay. Just learning how to put the submissions together was fun, and something that I plan to keep doing even for my independently published patterns. Having all the elements of a design together really helps me to focus, and I think my pattern writing will improve because of it. I’m disappointed of course, but mostly I’m just happy that I tried, and I’ll keep trying! Wow you did have a great week. Looking forward to your new pattern in the Drops Fabel sock yarn. Thanks Kathy! The sleeves are coming along sloooooowly. Kephren, I am so proud of you for making the leap into submitting your patterns! Keep up the good work and keep the submissions going. The more chances you take, the greater the possibility of having a design accepted. You are very talented. Go, Kephren!